MIT Medical is a full-service community health center serving Massachusetts Institute of Technology (MIT) students, staff and families, with inpatient, outpatient and urgent care medical services, dental and mental health programs, health plan administration, and wellness education. It occupies Building E23, a 100,000 sf, six-floor building. 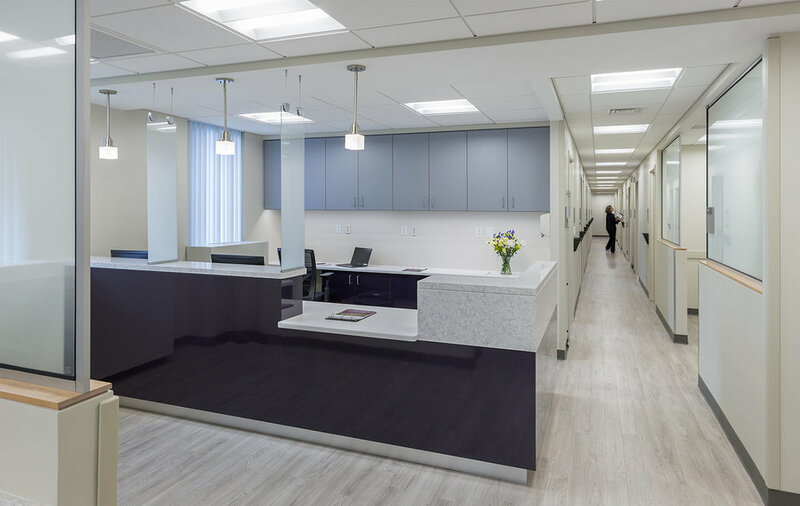 MDS was engaged by MIT to perform a comprehensive Master Plan to reorganize and optimize space use in all areas, modernizing interior treatments, and improving circulation and building systems. MDS was subsequently retained to design and implement several phases of renovations to the facility. With very limited available swing space, developing phased implementation plans was a priority. Our phased implementation plans relocated clinical units and renovated patient-care, support and common spaces, with minimal impact on existing programs in full on-going operation. Initial phases relocated OB/GYN, pediatrics, internal medicine and health education while expanding urgent care, mental health, the pharmacy and the optical shop. Phase 3A involved renovations to medical records and information services as well as infrastructure upgrades, and Phase 3B reconfigured of the Phlebotomy Department’s laboratory and clinical facilities.